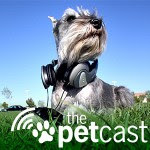 * 9:10 am: Meg Frost, founder of CuteOverload.Com. * 10:45 am: Dr. Noel Fitzpatrick, a surgeon calling in from the U.K. who fitted a dog with a prosthetic paw. Plus, lots of chit-chat about the pet-news of the day, including the Michael Vick dogfighting case and more. Join us at LVRocks.Com from 9-11 am PT! If you're even the least bit interested in the saga of Britney Spears in Vegas, the only place to turn is Robin Leach's blog, Luxe Life. Especially in the past few days as Brit caused mayhem at the Wynn. I was supposed to have lunch yesterday with the Wynn spokeswoman who canceled because she had a "meeting." Now it can be told. Check out it, and hats off to the grand master of gossip. OK, it's not really much of a scandal. That was just to get your attention. But still. Take a good look at the price tag to the upper left. Click on it to make it bigger if you must. 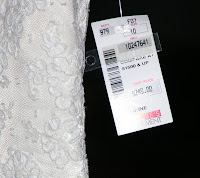 That's one of the tags on each of the some 50 wedding dresses that the "Today" show gave away during a shoot on Tuesday morning at the Venetian as part of a promotion in which they'll choose one couple from around the United States to have a televised wedding this fall. I was there at the ungodly hour of 4 a.m. to interview Al Roker for possible use in my Las Vegas Weekly column and on this week's "The Strip," although I did neither because, well, Roker ducked all my tough questions. What hard-hitting questions could I have for a hokey weatherman, you might wonder. Well, on Don Imus, on ditching "Opie & Anthony," on his recent remarks about epileptics, on Katie Couric's CBS woes. And then after Al grumbled away from me, he goes out into St. Mark's Square announces to the viewing audience at home that some of these dresses were worth $5,000! 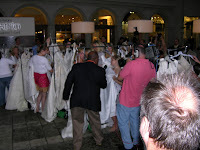 Then he made a hoard of carefully screened (for their size, methinks - fatties need not apply) brides-to-be degrade themselves by climbing all over one another to grab whichever of these precious garments they wanted. What a way to pick out your garb for the most important set of pictures you'll ever take, huh? But, anyhow, again, take a good look at that price tag. Every dress had the same one: $249. That's a bit lower than $5,000. 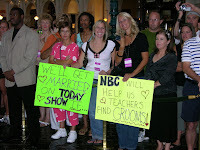 But hey, it's a morning TV news show. Accuracy, schmaccuracy. 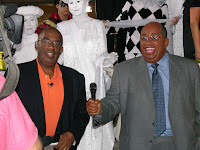 When Roker wasn't avoiding a predawn grilling by yours truly, he was yukking it up with his much-heavier Madame Tussaud's model, created before his stomach was stapled and enjoying his adoring crowd. Didn't much want to talk about that, either. Meanwhile, Miles and his crew from KVBC were busy trying to get some reports off and had a lot of technical problems that vexed the entire enterprise. Nonetheless, he still looked terrific outside the Venetian as day broke, no? The Strip is LIVE Tonight, 7-8 pm PT! Departing from our usual celeb-driven format, we're focusing this week on security and safety in Las Vegas following the Luxor car bomb incident and the New York-New York shooting. This week's show features an interview with former Sheriff Bill Young and a chat with Justin Lampert, an Iraq War vet from North Dakota who helped tackle the shooter at the New York-New York. Plus, news from Vegas, the trivia question, the poll, letters and the Top Secret Tourist Tip of the Week. Join us live from 7-8 pm PT at LVRocks.Com. There were some very interesting pieces in today's Sunday paper, my favorite being a fun feature by the Review-Journal's Henry Brean on movies set at the Hoover Dam and creepy ones from the AP about a machine being taught to beat people at poker and the trend toward companies and hospitals putting microchips in humans to track them for various reasons. I even learned in Sports today that there's a BoSox centerfielder named Coco Crisp, which made me giggle. On a related note, I had to smile at the weekly "I hate Sherm" column by my steamed colleague Brian Greenspun over at the Sun. As usual, his taunts are sophomoric, boring and a chore to read. For those who try, I have a story (which is absolutely true) that may help. 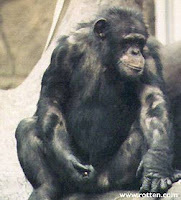 It's about a monkey I once saw as a kid in my neighborhood pet shop. This little monkey had a problem with ... well ... let's just say as politely as possible that the little guy had a penchant for engaging in repeated acts of self-gratification. When unsuspecting customers wandered near the monkey's cage, he would squeak in anger, pull a blanket over his lap and then furiously continue on as if no one could see what he was doing. That's Brian Greenspun in a nutshell. When he is caught in his journalistic acts of self indulgence, Brian angrily squeaks and pulls a blanket over his figurative lap. Then, he pounds away, as it were, as if people are unable to see what's really going on. Sigh. Insert your spank-the-monkey joke here. When are both of these kids gonna grow up? How embarrassing for both of these men, their publications and their staffs. But, I admit, endlessly amusing to the rest of us.